Spring Special - Stay 3 nights, get the 4th FREE! Fabulous villa, sleeps 10! **ONLINE BOOKING** TRAM and Wifi INCLUDED! Create wonderful vacation memories in this newly renovated family friendly 3 bedroom Beachwalk Villa home. Situated peacefully among majestic pines and lush landscaping, this lakefront home offers an abundance of space for family and friends to relax and enjoy their time at the beach. This home features a beautiful open family room with access to a deck perfect for dining and enjoying the amazing sunsets over the lake. A well stocked kitchen with granite counter-tops and with new appliances along with a dining table for 8 provide a great backdrop for cooking, and the wet bar is a perfect addition for afternoon cocktails. The first floor also offers a master bedroom suite with queen sized bed and en suite bathroom. Another bedroom on this level features 2 sets of twin bunk beds with built in stairs and an adjacent bathroom. Upstairs, you will love the large second master suite with King sized bed, private balcony overlooking the water, and large bathroom with separate shower & garden tub. There is also a spacious loft area that has a queen sleeper sofa, television, DVD player and a collection of board and card games for your enjoyment. Outside, a short walk across a picturesque bridge takes you to the private Beachwalk pool. 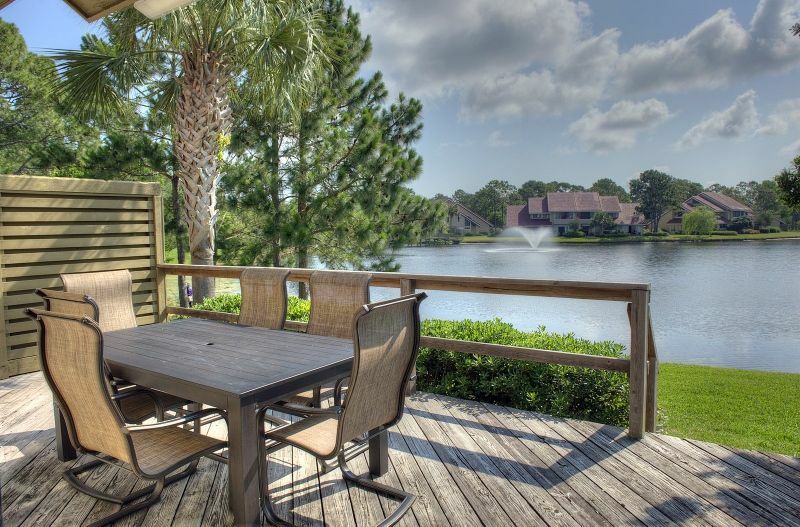 Just steps from everything Sandestin has to offer, this villa is ready to accommodate you and your family. The property needs some repairs. Lots of Sheetrock damage. Huge scrape on living room wall next to television. Water pressure isn’t great. Kitchen faucet lose. Master bath tub faucet cold side also needs repair. Unit Needs to be repainted. Close to beach. Blender, washing machine, outdoor grill worked great. The pool seemed further to our group than original advertised. 10am check out seems tad earlier than industry standard and we were denied later. Overall, we had a great stay. Good location at a great resort. Wish a golf cart and free use of things like resort pools and fitness center had been included. Platinum Vacations was good to deal with but unit had some maintenance/upkeep issues. Xplorie pass was nice overall but wish unused days would have carried over. Everything was perfect!! The pictures does not do the villa justice!! We are in love and next year we would like to stay in 5191 again just because of that!! We could not find one single thing to complain about!! It was absolutely perfect!! The property is ran well all the way down!! Do not change a thing!! WE ARE IN LOVE!!! Dear Preston, It thrills us to know that you had a vacation of a life time in this charming villa. It is the perfect spot for families to enjoy with lush landscaping surrounding Horseshoe Lake and you are only a 5 minute walk to the sugar white beach. The villa is very spacious and contains all the bells and whistles you would expect in your own home. Remember to book directly with Platinum Vacations of Destin to avoid any 3 party fees. We thank you for choosing Platinum Vacations of Destin and we hope to see you again soon. Love the Beachwalk area. Have returned to the area twice! First impressions are important. Weeds as high as my knees great you as you walk up to a dirty, scuffed beat up front door. All the tile floors were so sticky your shoes would stick as you walk. The furniture in the living room was garage sale conditions as you sat in a chair your knees where up higher than your body. Windows were filthy and there was coffee rings in the cupboards where the dishes where. The skillet was so greasy when I got it out of the cupboard I had to wash my hands and the pan. Microwave revolving plate would not turn until many attempts. The beds where great! The home was comfortable and in a nice area, loved being able to watch the birds on the pond. Home was nicely furnished and very comfortable beds. Rental office was outstanding. Rates are subject to change. Add'l fees & taxes applied. A deposit in the amount of 1/2 the total rate is due at the time the reservation is made. The remaining balance is due 30 days prior to your arrival. If the reservation is made within 30 days of the arrival date, the full payment is due at the time of booking. PLATINUM VACATIONS OF DESTIN , LLC is an independent company that is not affiliated with, sponsored by or associated with any entity containing the word "Sandestin." Any use or reference to the word "Sandestin" is in the dictionary or factual sense to identify a property or location and not to suggest any affiliation with any SANDESTIN® branded entity, product or service.